Samsung Electronics introduced today the Samsung PRO Endurance microSDHC™/microSDXC™ card, which offers industry-leading endurance and up to 43,800 hours of continuous video recording^2^. Designed for consumers and B2B channel customers who use intensive video monitoring applications such as surveillance and security cameras, body cameras and dash cams, the PRO Endurance makes continuous video monitoring fast and stable. It delivers read speeds of up to 100 MB/s and provides FHD recording and 4K support via write speeds of up to 30 MB/s. "Consumers want to feel assured with their video surveillance solutions, and the need for longer-lasting, higher performing memory cards that can withstand extreme conditions and capture critical moments is at an all-time high," said Un-Soo Kim, senior vice president of Brand Product Marketing, Memory Business at Samsung Electronics. "Samsung is proud to again advance what is possible in memory card technology with the introduction of the PRO Endurance, which offers security-minded consumers the industry's highest levels of endurance and optimized read/write speeds for immediate access to critical surveillance content." 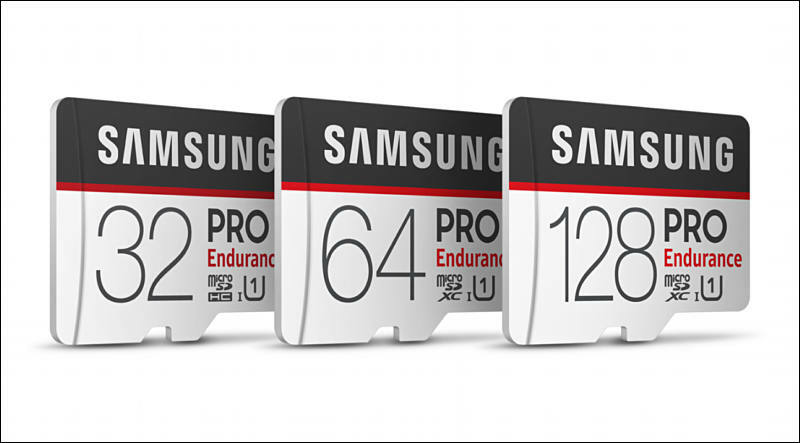 The Samsung PRO Endurance offers 25 times higher endurance^4^ than previous speed-focused cards^5^. It also comes with an industry-leading limited warranty up to five years^6^, and sets a new standard for capacity with its 128GB^7^ of storage. The Samsung PRO Endurance is built to withstand harsh environments and features Samsung's 4-Proof^8^ protection, making it water, temperature, magnetic and x-ray-proof. In times of emergencies, accidents or crisis, the PRO Endurance is the reliable solution to capture the crucial moments without the risk of compromised or lost data. The PRO Endurance memory cards are now available for purchase with manufacturer's suggested retail prices starting at $89.99 for 128GB, $44.99 for 64GB and $24.99 for 32GB. For more information, please visit www.samsung.com/memorycard.